It sounds like the wheels are already turning for the Chargers to make some big wholesale moves once the season ends. The San Diego Union Tribune reports that if A.J. 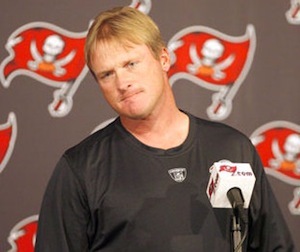 Smith is canned, he’ll turn around and grab Jon Gruden and head to St.Louis to run the show there. The first order of business for team president Dean Spanos is whether to retain General Manager A.J. Smith. Should Smith be fired in San Diego, he is expected to have opportunity elsewhere. People familiar with Rams owner Stan Kroenke’s plans said Monday that Kroenke is waiting for Spanos to make a move on Smith. If Smith is available, league and agent sources strongly indicated that Smith will be hired as Rams’ general manager and bring along Jon Gruden as head coach. Sources said Gruden has decided to return to coaching in 2012 and that his current employer, ESPN, is already preparing for his departure.